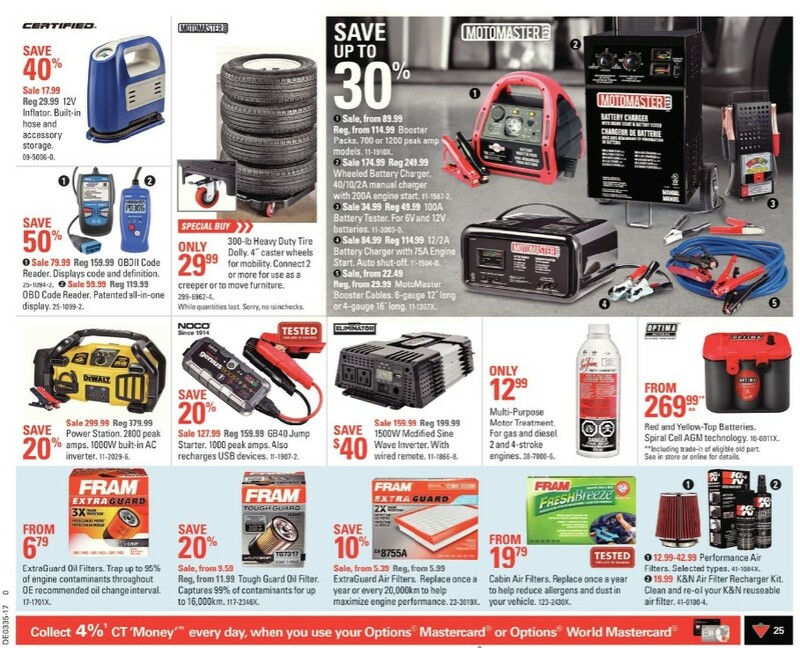 Canadian tire tires flyer Prices Aug 24 - 31, 2017. 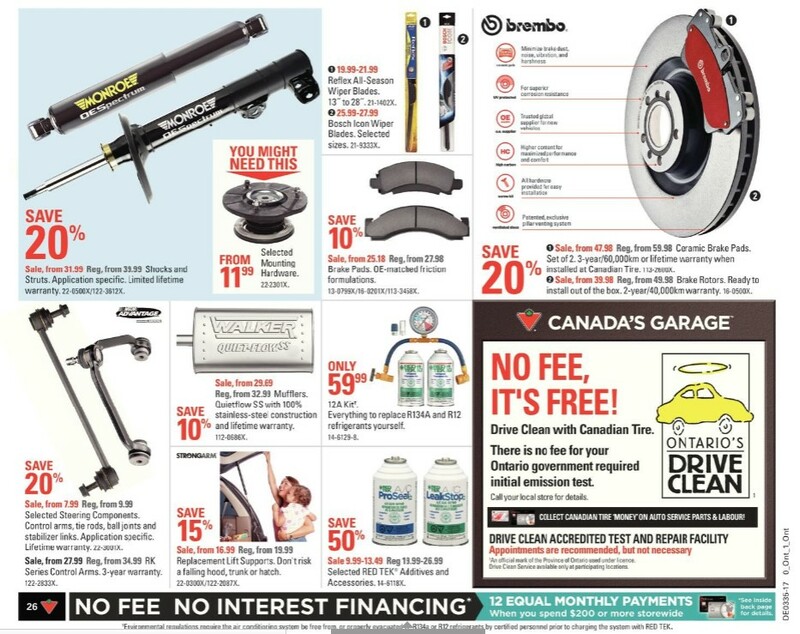 Shop for tires at Canadian Tire an find prices this week for them. Save up to $245 when you buy 4 Continental Extreme Contact DWS06 Tires. 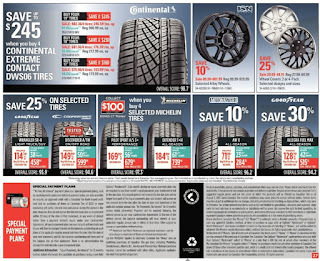 Price for Continental Extreme Contact DWS06 Tires - 18" Model #: 225/40R18 92Y This was selling for $212.99 last week and now Price $170.39, Up to $230.00 Savings $56.80/month. Sale: $681.56/4 tires. Find more details Canadian Tire tires prices this week, you can find on page 29. Continental Extreme Contact DWS06 Tires - 17" #:215/45R17 91W Regular Price $179.99 - Price $143.99 Up to $160.00 Savings $48.00/month. 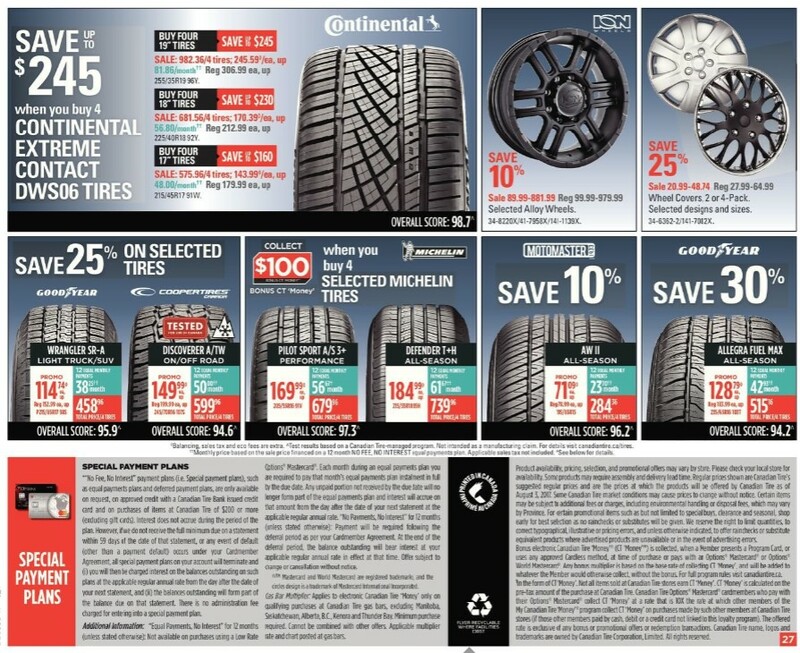 Sale: $575.96/4 tires. Continental Extreme Contact DWS06 Tires - 19" #:255/35R19 96Y Regular Price $306.99 - Price $245.59 Up to $245.00 Savings $81.86/month. Sale: $982.36/4 tires. Wheel Covers #:34-6362-2/141-7082X Regular Price $27.99-$64.99 - Price $20.99-$48.74 25% Savings 2 or 4-pack. Selected designs and sizes. Good Year Wrangular SR-A Light Truck/SUV Tires #:P215/65R17 985 Regular Price $152.99 - Price $114.74 12 equal monthly payments $38.25/month. Salem price $458.96 total price/4 tires. Overall score: 95.9. Coppertires Discovewre A/TW On/Off Road Tires #:245/70R16 107S Regular Price $199.99 - Price $149.99 12 equal monthly payments $50.00/month. - Price $599.96 total price/4 tires. Overall score: 94.6. Tested for life in Canada. Michelin Pilot Sport A/S3 Performance Tires #:205/55R16 91V - Price $169.99 12 equal monthly payments. $56.67/month. - Price $679.96 total price/4 tires. Overall score: 97.3. When you buy selected michelin tires, collect $100.00 bonus ct 'money'. Motomaster AW II All-Season Tires #:195/65R15 Regular Price $78.99 - Price $71.09 10% Savings 12 equal monthly payments $23.70/month. - Price $284.36 total price/4 tires. Overall score: 96.2. Good Year Allegra Fuel Max All-Season Tires #:235/65R16 103T Regular Price $183.99 - Price $128.79 30% Savings 12 equal monthly payments $42.93/month. - Price $515.16 total price 4/tires. Overall score: 94.2. Also don't miss it Sharpen your culinary skills only at Canadian tire flyer store valid August 24 - 31, 2017.